How can I best view the ETA Aquarids meteor shower? The Eta Aquarids (ETA) are the third major meteor shower of the year, and is expected to be one of the greatest to witness in 2016. Like many other meteor showers, the Eta Aquarids are caused by the Earth passing through the dust particles of a comet. In this case, that comet is Halley’s Comet (1P/Halley).Each spring, Earth passes into a trail of dust from Halley’s Comet, and as a result, all the dust and debris burning up in our atmosphere produces the spectacle known as the Eta Aquarids meteor shower. In 2016, the Eta Aquarids are active from April 19th through May 28th. It reaches its peak on the night of May 5th into the morning of May 6th but will continue to put on a great display until the morning hours of May 7th. The peak is the moment of the strongest meteor activity, and this number is expected to range from 40 to 60 meteors per hour under perfect viewing conditions On average, observers in perfect conditions will be able to view one meteor every minute and a half. Our most recent meteor shower, the May 2016 Lyrids, were negatively affected by a bright moonlit sky. Fortunately, the New Moon occurring during the peak of the Eta Aquarids will darken the skies of the world, creating promising viewing conditions for those observing May’s “shooting stars”. The radiant of the Eta Aquarids, also known as the point from which all of the meteors appear to come from, is the “water jar” of the constellation Aquarius. Not coincidentally, Eta Aquarids are named after this constellation. While moonlight conditions appear to be fantastic be aware that local conditions such as cloud cover, light pollution, and precipitation will also play a major role in the number of meteors you are likely to see. For many observers, particularly those closer to the Northern Hemisphere, the Eta Aquarids will only be visible during the last couple of hours before the sun rises. This is due the radiant being located 60 degrees west of the sun, therefore it rises before the sun in the morning hours. Once you have settled down at your observation spot, look approximately half way up the sky facing east. This way you can have the Eta Aquarids’ radiant within your field of view. If you see heavy lights while facing east, face closer to the north or south. Looking directly up at the sky or into the radiant is not recommended since this is just the point in which they appear to come from. You are more likely to see a trail when looking slightly away from this point. Looking half-way up into the sky will lead to the best show in the house! Waxing Crescent moon. Gazing conditions will be perfect as the moon will not interfere with observing ETA Aquarids. Name origin: ETA Aquarids appears to radiate from the constellation Aquaris. 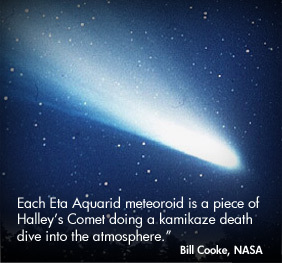 Parent: The ETA Aquarids are pieces of debris from Halley's Comet. 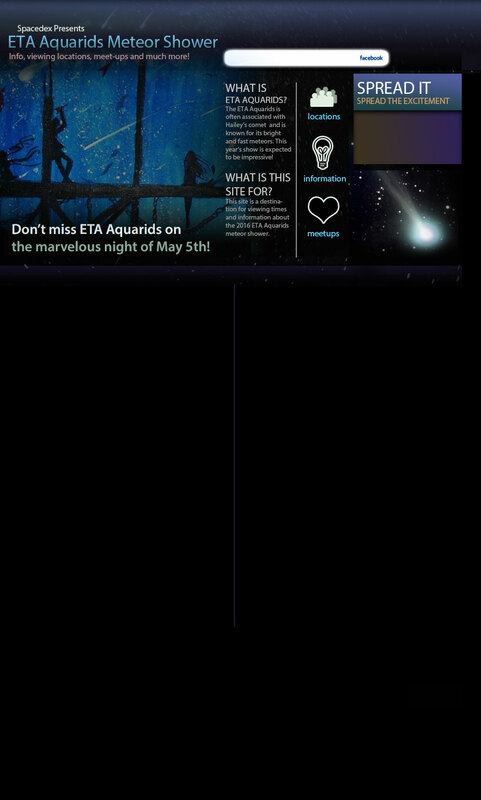 The Eta Aquarids (ETA) are the third major meteor shower of the year. Like many other meteor showers, the Eta Aquarids are caused by the Earth passing through the dust particles of a comet. In this case, that comet is Halley’s Comet (1P/Halley).Each spring, Earth passes into a trail of dust from Halley’s Comet, and as a result, all the dust and debris burning up in our atmosphere produces the spectacle known as the Eta Aquarids meteor shower. In 2016, the Eta Aquarids are active from April 19th through May 28th. It reaches its peak on the night of May 5th into the morning of May 6th but will continue to put on a great display until the morning hours of May 7th. The peak is the moment of the strongest meteor activity, and this number is expected to range from 30 to 50 meteors per hour under perfect viewing conditions On average, observers in perfect conditions will be able to view one meteor every minute and a half. Our most recent meteor shower, the May 2016 Lyrids, were negatively affected by a bright moonlit sky. Fortunately, the New Moon occurring during the peak of the Eta Aquarids will darken the skies of the world, creating promising viewing conditions for those observing May “shooting stars”. New Moon. Gazing conditions will be ideal, as the Moon will not interfere with observing ETA Aquarids.